This article was submitted to the Irish Citizens’ Assembly on climate on August 11, 2017. CapGlobalCarbon (CGC)’s proposal to the Citizen’s Assembly would enable Ireland to completely eliminate its fossil fuel production and imports within a fixed timeframe, while building solidarity with the Global South and providing valuable support to the climate justice movement. Please note that emissions other than those produced by the burning of fossil fuels are not covered by CGC. For a more comprehensive discussion on how to eliminate all Irish greenhouse gas emissions, please see Feasta’s submission to the Citizen’s Assembly. Since 2006 members of the Feasta climate group have been promoting Cap and Share as a way to achieve meaningful emissions cuts equitably. Briefly: Cap and Share would impose a binding cap on fossil fuel production, charge fossil fuel producers (or importers) for producing, and distribute the revenue from those charges on a per-capita basis. The cap would be lowered each year until eventually, by 2050 at the latest, fossil fuel production is eliminated. A variant on Cap and Share is currently under consideration by California state government. In 2015, the CapGlobalCarbon initiative was launched at the COP-21 climate summit in Paris. CapGlobalCarbon takes a global approach to Cap and Share. It takes as a central premise the notion that a healthy atmosphere is the right and responsibility of every human being on the planet. The initiative is featured in Naomi Klein’s Beautiful Solutions Lab. It has frequently been suggested that the most effective tool for achieving a zero- carbon economy is an appropriate carbon price. We agree with those who argue that pricing carbon will help to clarify the overall situation and enable more effective planning. Cap and Share would therefore employ a carbon price – but with vital additional features. Specifically, we believe this price needs to be adopted extremely carefully, with a particular focus on protecting the vulnerable and building economic resilience. The vital role played by oil in particular in maintaining long transport supply lines needs to be taken into account: some analysts believe that even a modest rise in the (historically low) oil price could trigger an economic collapse unless immediate steps are taken to shift towards a less transport-dependent economy. Even if economic collapse were avoided, a high carbon price without protective measures could cause immense suffering to low-income people who are currently reliant on fossil fuel for their heating and food supply. Another important point to note about carbon pricing is that any revenue generated from the price should be considered from the outset to be a temporary funding stream. The goal is to phase out fossil fuel use entirely by 2050 at the latest, so we must take care not to lock in any kind of economic dependency on carbon income. A final, but vital, point about carbon pricing is that it cannot be relied on to eliminate fossil fuel use by itself. The extremely high quality of fossil fuel energy, particularly oil, makes it unlikely that its use would be abandoned entirely even if it became very expensive. One can easily imagine a scenario whereby millions of people are priced out of carbon access, while a handful of wealthy climate-skeptics continue to use fossil fuels profligately. This is why a carbon price also needs to be accompanied by a binding cap on fossil fuel production. Fossil fuel production is inherently noxious, like asbestos production or the production of landmines, and needs to be completely phased out over time. There remains the question of what to do with the carbon revenues. We believe that they should be distributed on a global per-capita basis, as this reflects the fact that a healthy atmosphere is our collective right and responsibility. No entity – be it a corporation, private individual or government – should be granted the right to ‘enclose’ the atmosphere and gain financially from its exploitation at the expense of others. CapGlobalCarbon is by definition a global scheme. This means that it must eliminate 100% of fossil fuel emissions, regardless of where they originate. It also means that everyone in the world has an equal right to compensation from the use of the atmospheric commons. Simply put: those who pollute the atmosphere need to compensate all of humanity for their action. Ireland is a small country but has relatively high per capita emissions. It currently ranks 37th in the list of carbon dioxide emitters, with per-capita emissions in 2013 of 8.9 metric tons per person. We could make a useful start, and provide a good example to bigger and more powerful countries, by taking meaningful action in proportion to our size. • Both countries would agree to impose a cap on fossil fuel production and/or imports. This cap would be monitored by independent inspectors. • Revenue from the permits would be distributed to everyone in both countries on an equal per-capita basis. In the low-income country this would be brought about in consultation with charities and other agencies with experience in distributing cash transfers, and would probably make use of the mobile phone network. • Each year, the quantity of permits available would diminish as the cap was lowered. The floor price would be adjusted to ensure the same minimum income. • As an income of $10 a month would not go very far in Ireland, measures would also be introduced to protect low-income people in Ireland from the effects of the rising energy bills brought about by Cap and Share. These measures would include energy retrofitting of housing, the installation of community heating, diversification of agriculture and subsidising of farmers’ markets. They could be paid for by means of levies on the use of luxury high-CO2 products: for example, the motor tax on high-emissions vehicles could be raised (it should be noted that overall Irish motor tax revenue actually decreased after the introduction of emissions-based rating in 2008). A levy could also be placed on first class flight tickets, on luxury food products that are flown in from abroad, and on other high-CO2 luxury goods. Another possible source of funding to address fuel poverty could be from a Robin Hood tax. • Over the next decade, preparations would be made in both countries to introduce a land value tax as an eventual successor to CGC, along with other collective-property-based taxes. Revenue from these taxes would also be distributed per-capita. • By 2050, fossil fuel production would no longer be permitted and there would therefore be no more revenue from CGC. Other revenue streams such as that from the land value tax would take over to provide a more permanent income to the populations of both countries. These could constitute a universal basic income. Which countries could partner with Ireland in this scheme? To make the scheme easily scalable – i.e., to enable other countries to join the scheme easily – we would need a partner country whose per capita emissions, when combined with Ireland’s per capita emissions and divided by two (since there are two countries involved and we are interested in average emissions), comes to something approaching the global average. At present this global average is approximately 4.9 metric tonnes per year. One possible candidate is Liberia, which has a roughly equal population to Ireland but much lower emissions (0.2 metric tonnes per capita in 2013). Liberia’s per capita GDP is $478, so a $10 a month basic income deriving from CGC would have a substantial effect on average household income. The average per capita emissions for Irish and Liberian people combined comes to 4.55 metric tonnes. Another, more challenging but potentially rewarding possibility for a partner country is Eritrea. Eritrea’s population, at 5.4 million people, is slightly larger than that of Ireland. Eritrea’s per capita emissions have not even been measured in recent years because of its instability, but estimates put them at 0.1 metric tonnes per capita. It has a notoriously repressive government which would probably be difficult to work with. However, it arguably needs more urgent assistance than most other countries, as its instability has caused floods of refugees to leave the country in recent years, spreading its humanitarian crisis to neighbouring countries. Many refugees have also undertaken highly dangerous sea crossings to Europe. Cap and Share in Eritrea could be made contingent on reforms by the Eritrean government to improve human rights (e.g., the elimination of the compulsory military service there). There are other possible candidates for partner countries too. The decision about which country to approach should be made in consultation with development charities. 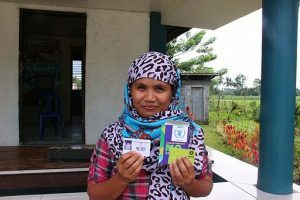 The enormous amount of experimentation and research in recent years into direct cash transfers in the Global South (with some programmes affecting tens of millions of people) should provide useful insights. It is important to note that the revenue from emissions should not be considered a charity handout but rather an entitlement deriving from our collective rights and responsibilities regarding the atmosphere. Recipients would be informed of how the overall system would function, and so they would take into account the fact that fossil fuels will be increasingly difficult to come by in the future (because of the binding cap on their production). This would influence spending and investment decisions in favour of localised food production and energy-efficient and renewables-based projects. Funds could of course be pooled into community-level initiatives where appropriate, and used to finance legal support for establishing land rights where necessary in the Global South. Over time, other countries could copy this bilateral agreement, entering into Cap and Share partnerships. The scheme could also work on a regional level: for example, individual states in the US, China and India could adopt it in partnership with other regions or countries, and so could blocs of countries. Permits could be auctioned all together for all of the countries and regions involved provided their per capita emissions, averaged, approximated the average per capita emissions of those countries already enrolled in the scheme. Eventually the whole world could be involved (at which point CapGlobalCarbon would have attained its goal). It’s well known that Global South countries are the hardest hit by climate change, with extreme weather events such as droughts triggering food and water shortages in many regions of the world. Historically Ireland has had its share of food shortages too. Perhaps owing to this, we have a long tradition of providing development assistance to Global South countries. Global solidarity is an important Irish value. This proposal, relatively straightforward to implement, would establish Ireland as forward-looking, global-minded and fundamentally ethical in its approach to climate stabilisation. It could make a real, tangible difference to many ordinary people in precarious circumstances, providing hope and the ability to plan for the future. Its uniqueness and its emphasis on justice would probably attract international attention and it could be a trigger for more wide-ranging action worldwide. This report summarises the outcomes from a two-day event on June 8 and 9 2016 that was organised by Feasta, Cultivate and Trócaire. The event’s purpose was to provide a briefing on CapGlobalCarbon – a campaign organised by members of Feasta’s climate group – set it in the context of the commons, divestment and social justice, and generate ideas about how to implement it as part of a broader citizens’ movement for a fair and sustainable transition from fossil fuels. Many new ideas were generated as a result of this event, and there was a strong focus on the practical which is very welcome. While challenges were acknowledged and discussed, emphasis was placed on the potential for CGC to build partnerships with a wide variety of organisations and promote its message. There are two key questions that arise when one considers the practicalities of distributing the share in CapGlobalCarbon – or any other per-capita-based share of a common resource – globally: whether it would be physically possible to distribute equal allocations to every single adult or every single person in the world, and whether it would be wise. •	Unstable regions. Large areas of the world are either in a state of war or barely out of war, and the logistics of getting shares to refugees and displaced people could be daunting. •	Lack of infrastructure. This problem could affect the distribution of the share, since getting emissions allocations or cash to people who live off-the-grid and far from any road is a challenge, and it could also affect the extent to which the share is useful. There’s not much point in having cash if there’s nothing meaningful in the locality to spend it on. •	Possible gold rush effect. Local economies could be destabilized by a sudden inflow of cash, as has happened before in areas where a valuable natural resource was discovered. In this case the resource would be scarcity rent from the use of the atmosphere as a dump for carbon emissions, and as with other resources, its ‘discovery’ could trigger problems such as inflation. It could be particularly damaging to communities which are not very dependent on cash at present. Moreover, as with other resource discoveries, an economic boom in the area would likely be ephemeral and might quickly give way to a bust, particularly if the world economy collapsed because of energy shortages. •	Problems related to the temporary nature of the scheme. If the cap is successful in bringing emissions down to zero over time, the scheme will end. But there could be resistance to the gradual winding down of CapGlobalCarbon both on the part of the people employed to carry it out and of those beneficiaries who gain the most from it. •	Possibility of an increase in violent crime. Some areas of the world are already in a state of crisis because of climate change or other disasters, and desperate people might take extreme measures to get hold of as much cash as they can. They might also spend it on weapons. Vulnerable groups such as women and the elderly could be targeted. •	Vested interests. As we’ll see, one of the effects of allocating the share would likely be a decrease in inequality. This could be perceived as very threatening by people who benefit from the status quo, such as big landowners in Brazil. They tend to have a lot of political clout and could make it difficult to implement the programme. •	The instability of debt-backed money. This is a different type of problem from the others listed above: it’s an area which Feasta members have explored in some depth but which tends to rarely come up in discussions about climate action. Nevertheless, it’s relevant to any project that includes wealth distribution. The crux of the problem is that the national currencies (and the euro) which we rely on for our everyday economic transactions are inherently very fragile because they are based on debt. So using these currencies as the primary way to express the value of the share seems likely to prove unwise, to say the least. This list may seem quite forbidding. However, the world situation is evolving very quickly and there are three recent phenomena which we can factor against the objections listed above. Twenty years ago it’s likely that none of them would have been weighty enough to make much difference, but as we’ll see, circumstances are different now. Let’s take a look at each of them in turn. Broadly speaking, it used to be widely assumed that developmental planning was something best undertaken either solely by governments or by a combination of governments and big businesses who would undertake massive projects such as dam construction. Then, in the eighties and nineties, government went out of fashion and there was a trend towards privatizing publicly held resources such as water and energy. As Justin Kenrick and Nick Bardsley point out in their chapters of Sharing for Survival, agencies such as the IMF and World Bank have become notorious for pressuring countries to adopt these policies. In some areas such practices continue to the present day. But it is increasingly recognized that there are enormous problems with putting all the big planning decisions in the control of large bodies, be they public or private. Such problems include corruption, a systematic, relentless transfer of wealth from the poor to the rich, too much bureaucracy, a lack of accountability and misperceptions as to what ‘ordinary’ people actually want and need. An important aspect of the reaction against this is the global commons movement which Justin Kenrick describes. I’ll be discussing another aspect here: the surge in interest over the past decade and a half in social transfers. Social transfers are anything useful that lends itself to per-capita distribution by governments or NGOs. They can take the form of cash, food or vouchers, among other things. Cash transfers in particular are becoming more and more popular, despite initial fears on the part of some observers that they would create dependency and stifle initiative. In their book Just Give Money to the Poor: The Development Revolution from the South, Joseph Hanlon, Armando Barrientos and David Hulme write that cash transfers are a “southern challenge to an aid and development industry built up over half a century in the belief that development and the eradication of poverty depended solely on what international agencies and consultants could do for the poor, while discounting what the citizens of developing countries, and the poor among them, could do for themselves”. They add that “the biggest problem for those below the poverty line is a basic lack of cash. Many people have so little money that they cannot afford small expenditures on better food, sending children to school, or searching for work”, and they cite statistics showing how cash transfers have substantially reduced poverty in countries as diverse as Brazil and Mongolia. They note that poorer people who receive transfers are more likely to spend the money on locally produced goods than richer people, who tend to spend more money on imports. Additionally, poorer people are more likely to use the transfers as leverage for investments, rather than simply spending all the money immediately. Many charities and other NGOs are also now strongly promoting cash transfers. GiveWell, a nonprofit which analyses hundreds of charities and provides advice to donors, takes the line that “unconditional cash grants lead to large increases in recipients’ consumption, assets, business investment, and revenue”. They state that “cash transfers have the strongest track record we’ve seen for a non-health intervention, and are a priority program of ours.”  Caritas Internationalis, the worldwide confederation of Catholic relief organisations (of which Trócaire is a member), lists as one of its core responsibilities the need to “acknowledge cash transfers as an effective humanitarian tool and commit to using or facilitating use of cash wherever feasible and appropriate in humanitarian response”. Even the World Bank, which is not noted for its radical views, has come round to endorsing cash transfers, albeit in a form which some argue to be unnecessarily complex. Social transfers can be short-term, with the goal, for example, of providing emergency aid to people who are having difficulties, or longer term, to help provide financial stability so that people can make investments and plan realistically. Sometimes they come with strings attached, as in various Latin American countries where people are guaranteed a stipend if they enroll their children in school. These are known as conditional transfers. They can be targeted, i.e., given only to people who fall within a certain income range or live in a particular area, or they can be universal. So how would CapGlobalCarbon fit in with this? It seems clear that the share in CapGlobalCarbon could be considered to be a universal, temporary, unconditional cash transfer, to be allocated by an NGO which would probably take the form of a trust. We should note however that there are three differences between it and existing social transfer programmes. The first difference, which is probably not very important, is that the goal of existing social transfer programmes is usually either poverty relief or ‘development’, purely and simply; such programmes generally make no reference to the environment or even to commons-based rights. This difference in purpose would have no effect on the mechanics of distributing the transfers, and in any case, if CapGlobalCarbon were to be carefully implemented, it would be quite likely to substantially reduce poverty, at least in the short term (see below), and to trigger investment in renewable energy and other development-friendly projects. The second difference is in the source of the transfer funds. Existing social transfer programmes are all funded from taxes or from donations to charities, and so take the form of wealth redistribution. The share in CapGlobalCarbon, however, is a form of predistribution since it derives from the natural commons of the atmosphere. Thus, it might not be subject to some of the short-term political pressures that tax-funded social transfer schemes can sometimes fall victim to, which would of course be an advantage. Indeed, Hanlon et al actually suggest towards the end of their book that the funding from carbon use fees be used internationally as cash transfer revenue; their rationale for this is that funding for the transfers would be more reliable under such a scheme than tax- or loan-based funding. So these authors have independently developed an idea that comes quite close to CapGlobalCarbon. •	70% of the population would be better off because they would receive more from selling their emissions permits than their cost of living would go up. The income of the bottom 20% could double. •	The richest 20% of the population could see its income reduced in the short-term by 14% while the 10% of people with middling incomes would be unaffected because their increased costs would be balanced by their increased income from selling their permits. We can see that in both countries there would be a huge reduction in income inequality. The sudden rise in income of the lower-income population deciles would be likely to trigger radical shifts in the countries’ economies, and indeed in their societies and cultures, and the power relations between these countries and the rest of the world would also change. There is plenty to think about here. We’ll discuss some of the implications further below. The third difference is likely to be the most important one: it is that the share in CapGlobalCarbon would not be a dependable, fixed amount of money, but would fluctuate in value depending on how much the fossil fuel permits were worth at auction. At the beginning it would quite possibly be far more valuable to most of its recipients than any social transfer made at present (with the exception, some would argue, of financial bailouts made to billionaires on Wall Street – a rather different kind of cash transfer from that promoted by the UNDP and ILO). As mentioned above, in some areas its value could be so great that it could even destabilize the local economy, although there may be ways to ease this pressure . Later on, the value of shares would depend on the extent to which the world economy was succeeding in transferring to renewable forms of energy. This places CapGlobalCarbon in sharp contrast with current social transfer programmes, which only deal with relatively small amounts of money that do not fluctuate. What are the implications? Obviously, CapGlobalCarbon could not be part of a “social protection floor” as it would not provide a reliable income or food security. However, the emphasis placed by social transfer schemes on providing individuals with decision-making power about how to allocate resources dovetails very neatly with the commons- and resource-based philosophy behind CapGlobalCarbon. Many charities express their support for social transfers in terms of individual rights and agency. Moreover, if Hanlon et al are right, any distribution of wealth in favour of the poor will tend to stimulate local economies, a fact that has important ramifications for cutting down on fossil fuel use: it means that the share in CapGlobalCarbon could reinforce the carbon cap by creating an environment in which locally-based industries are able to develop and flourish. It could also be pooled by community members and used to secure customary land tenure systems such as Justin Kenrick describes in his chapter. In addition, as mentioned above, the investment possibilities for people receiving funds would certainly apply to people looking for uses for the share in CapGlobalCarbon. The money could be treated as a nest egg to be used for projects that would improve their lives, such as education or better housing. It would clearly be important to make sure that beneficiaries were getting accurate information about CapGlobalCarbon in order to avoid confusion. If it was understood that the scheme was temporary, they would be likely to make very different decisions about what to do with their allocations than if they were under the impression it was permanent. However, we should note that even though CapGlobalCarbon itself would be temporary and the value of the allocations would fluctuate, there is no reason why it couldn’t serve as a springboard for a more stable permanent transfer scheme, such as a basic income derived from a Tobin tax or land value tax. The same databases and communications networks could be used for such long- term schemes, and CapGlobalCarbon could perform a useful role in providing the initial capital to get the overall system going while the details of establishing a source of revenue for a more permanent scheme were being hammered out. This might have the convenient side-effect of warding off some of the potential problems with CapGlobalCarbon being a temporary scheme: employees would have more security and beneficiaries would know that they could count on receiving transfers in the longer term. Let’s move on now to examine the second global trend which could provide a boost to a CapGlobalCarbon: the widespread adoption of technologies which could be used for distributing the share. 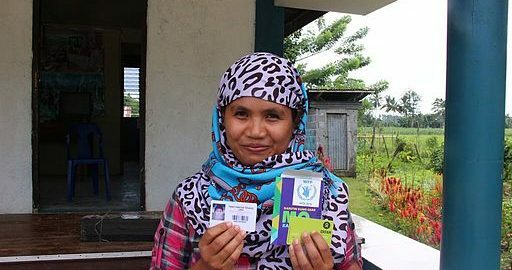 According to the Overseas Development Institute, “[the] evidence is compelling: in most contexts, humanitarian cash transfers can be provided to people safely, efficiently and accountably.” If we look at the many experiments that have been done with distributing cash transfers we get some idea of the possibilities. Those which have the most potential for overcoming distribution challenges are probably smart cards and mobile phones. Namibia, Botswana and South Africa now use smart cards for their universal pension schemes. Once the smart cards have been created there is no need for any other identification, since smart cards can record people’s fingerprints, which can then be checked with a simple digital camera each time a transaction is made. Recipients can opt to keep some or all of their funds in the card account. They access the funds through banks, mobile ATMs or through point-of-sale terminals in shops. The East African Regional Hunger and Poverty Programme comments that “even street-traders and village merchants are now clubbing together to share the use of such low-cost terminals.” This means that recipients of the pension do not need to live anywhere near a bank or post office in order to make use of their allocations – they need only be in striking distance of a market with vendors who use the terminals. They could opt to withdraw only some cash or to go entirely electronic when paying the merchants with the terminals. Such terminals can be run on solar power, so areas which are not on the electric grid could be included in the scheme. As with smart cards, beneficiaries could spend some of their allocation immediately on food or other provisions if they wished, and they could also opt to keep some in the mobile account for later. This ability to manage money wirelessly and store it securely by electronic means is so convenient that a New Statesman article from 2008 argues that mobile phones are likely to become dominant as the way to handle money in the future. (Previously, people had to send wire remittances if they wanted to transfer money from place to place, which were cumbersome and costly.) You can see this playing out in Kenya, where as of May 2016, 20% of the GDP was handled by the mobile phone system. Another point we should note about mobile phones is that in addition to being used for financial transactions, they are, as one might expect, still doing their original job – putting people in contact with each other, or to put it more trendily, building social networks. As of 2016, there were almost 7 billion mobile phones being used worldwide: almost as many mobile phones as there are people . This penetration of the market in non-industrialised countries is striking: the continent of Africa has landline penetration of just 1.4 subscriptions per 100 people, but 63.5 cell subscriptions. This opens up some interesting possibilities for CapGlobalCarbon, which we will explore further below. However, we should first consider another question that was mentioned at the beginning of this section with regard to allocation distribution: the potential for violent crime. This could occur in the very direct form of gangsters who might wish to steal allocation funds. More generally, there is also the challenge of allocating emissions rights in the many parts of the world that are highly unstable. How could a social transfer programme possibly function in such situations? In a 2006 book on designing social transfers, Michael Samson of the South African Economic Policy Research Institute asserts that “Even in fragile states – such as Nepal and early-1990s Mozambique – governments have effectively delivered social transfers.” He describes a transfer scheme that was implemented in Mozambique in the 1990s, during the civil war there, and comments that “the programme worked remarkably well in the first five years” (later on it foundered due to administrative and funding problems, and it has since been replaced by another scheme). Various techniques can be used to ward off would-be robbers. For example, in areas where a mobile ATM machine might be vulnerable to hijackers, agencies use tactics such as changing the route that the vehicle carrying the ATM takes each time it enters the area, and having it stop to distribute cash in different places as well. In fact, I came across only one direct reference to a hijacking of a vehicle carrying cash intended for social transfers, in Uganda, and this hijack was considered rather exceptional – it was an inside job, carried out by people working on short-term contracts for the agency. The report which described the hijacking concluded that longer-term transfer schemes in which the distribution work is contracted out are much less vulnerable to this kind of problem: “Using [such a] system goes a long way towards minimising the possibility of insider mischief; agents are not short-term contract staff, they are entrepreneurs looking to build a sustainable business so have a vested interest in the system working safely ”. One might wonder, though, whether the large amounts of money likely to be involved with CapGlobalCarbon might not create a greater incentive for violent crime. After all, most existing cash transfers involve only modest sums, not enough for it to be worth a gangster’s while to chase down recipients after they have collected their cash and force them to hand it over. With CapGlobalCarbon we could be talking about serious money, as is suggested in the reports on India and South Africa. One way to deal with this could be to encourage people to use their smart card or mobile phone accounts as safe storage places for their money, and only withdraw cash in small amounts as needed. There may also be other good reasons for people not converting all of their emissions allocation into the local currency for immediate personal use, as we shall see. However, it could be that the threat from crime is somewhat overblown, particularly if we take into account the effects of the share. As mentioned above, one of its effects would likely be a decrease in income inequality – indeed, most social transfer programmes have this effect  – and there is a great deal of evidence that as income inequality decreases in a country, so too does violent crime . Of course it should not be discounted altogether, but it may be less of a problem than one would fear. One other point we need to discuss when considering the use of modern technologies is the possibility – even probability – of system collapse. Some analysts believe that the world’s communication infrastructure is actually very fragile – it is, after all, intermeshed with the wider fossil-fuel-based economy – and that a trigger such as a shortage of oil could send it over the edge, causing the entire communications network to rapidly unravel. In such a case, obviously it would be impossible to continue using it to allocate the share. However, the fact remains that the communications network is the most efficient means we have to allocate the share at present, and it makes sense to use whatever is available to get things moving quickly. Even if our success in allocating the share is short-lived because of a system collapse, there’s a reasonable chance that we will have improved the medium-term and perhaps even long-term stability of many regions of the world by reducing the risk of more serious climate change, decreasing inequality, helping to secure key commons rights and encouraging investment in locally- based energy and food production. This will help many people cope with the coming shift to an economy without fossil fuels. Moreover, there’s a certain poetic justice in using the very technologies that are considered by some to symbolize an exploitative and rapacious economic system to help to bring that system to as smooth an end as possible. Or, to put it less loftily, simple decency would suggest that we put these things to as good a use as we can while they’re still available to us. We have taken a look at some techniques for distributing allocations, and this hopefully has allayed at least some of our fears that such a distribution scheme would be unworkable. Now let’s turn back to some of the other challenges described earlier: the lack of good things for individuals in some places to spend share money on, and the possibility that the large influx of money that could take place in some areas would cause inflation or destabilize the economy in other ways. With regard to the latter problem, as already mentioned, if we look at past experience we can find many examples of per-capita distribution of resources, but thus far the amount of money distributed to each person has been relatively modest. We can also find plenty of examples of areas which experienced a sudden, large inflow of funds, such as gold rushes. However, to the best of my knowledge there has never been an occurrence of both together – or in other words, a situation where every single adult member of a community has received a series of rather large sums of money. The closest thing is probably the Alaska Permanent Fund, which allocates a part of its revenue to every adult citizen of Alaska each year. This is around $2000 per person at the moment and for some people it represents 10% of their annual income, but we have seen that CapGlobalCarbon in India could dwarf that, increasing the income of many people fivefold or more. Historically, gold rushes have been characterised by their unpredictability – the fact that nobody knew in advance that they would take place – and by the unevenness with which the revenue from the newly-discovered resource was distributed, with some people becoming wildly rich in a very short time while others were left behind entirely. Both of these factors have a highly destabilizing effect on an economy. However, neither of them would apply to the share in CapGlobalCarbon: everyone would know in advance that they would be receiving money, and everyone would get the same allocation. Even so, it seems clear that we shouldn’t dismiss the possibility of destabilization. For one thing, countries which experience a sudden surge in income because of the discovery of an important raw material can sometimes run into problems with exports because their currency gains a lot of value owing to demand for that raw material, making their exports more expensive (‘Dutch disease’). In the case of CapGlobalCarbon the “raw material” would be emissions rights, and countries whose inhabitants mostly didn’t use much fossil fuel, such as India and much of Sub-Saharan Africa, would be “exporting” the rights elsewhere. Their currencies might then rise in value, which could adversely affect other sectors of their economies; many of these countries export other raw materials, and it’s possible that they would experience a slowdown in those exports. On the other hand, the increase in value of their currencies would make it rather easier for them to pay off international debts, which have had a crippling effect on their economies. Indeed, this ability to pay off debt painlessly is a strong point in favour of CapGlobalCarbon. As with any macroeconomic issue, there are enormous complexities and unknowns here. We could probably get a clearer idea of the effects of the share in those countries where it would be very valuable to individuals by doing a more thorough study of the historic effects of gold rushes and other “rushes”, while taking into account factors such as the degree of income inequality already existing in places that experienced them, and the extent to which the incoming wealth was distributed among the population. Another possible problem we’ve mentioned above is that the sudden increase of cash in local economies could lead to inflation of prices for basic staple products and perhaps also for land. People would still need the same essential goods that they needed before the money arrived, but there would be a lot more money chasing the same goods – a classic recipe for inflation. They would also be looking for secure places to park excess money and so there could be a scramble to buy up land. Since land is always limited in supply, there could then be all kinds of problems with some people being left behind in the dust while others in their communities charge up the property ladder, and with speculative bubbles forming. In the long term, a land value tax such as Nick Bardsley describes  would take care of such problems, but very few places in the world have implemented such a tax at the time of writing. But to be on the safe side, let’s still assume that there would be a strongly destabilizing effect if we simply divided up the allocations and made them immediately tradable into cash for everyone, and look at a way to try and forestall it. The problems described above could easily be assumed to derive from some fatal element of human nature – the greedy, grasping side to human beings. We’re all frail and flawed, after all. Indeed, some may argue that it’s naïve to believe that ordinary people can be trusted at all to make sensible decisions about ‘windfall’ cash that they receive. Perhaps it would all be spent on beer or fast motorcycles. So there are practical reasons to take the per-capita approach. But there are also strong reasons having to do with ethics and justice: if the ‘ordinary’ people aren’t deciding where the allocation money should go, who is? We need to be clear that we are not talking about a welfare handout. This money is rental income from the use of the atmospheric commons, money that belongs to all of humanity (along with other species, and future generations). What right does anyone have to claim more than their share? In any case, it seems much more accurate to regard the source of this particular problem as deriving from the nature of money rather than that of people. Specifically, it’s the assumption that the share would have to be in debt-backed, bank-issued, bond-market-dependent money that could lead to problems. Here we’re led back to the final problem from our list at the beginning of the chapter. So perhaps we should take a creative approach to the type of money that is used for the share. In France, if you have a young child or are retired, you are entitled to a certain amount of “cheques vacances” per year. These can be spent like cash in a wide variety of places, such as campgrounds, hotels, restaurants, amusement parks, and theatres. Businesses can apply to accept these cheques – they just have to be involved in some way with recreation in order to qualify. The cheques expire after three years, so once you get them you have an incentive to spend them. One effect of this programme is that individuals who might not have found the time or energy to go on holiday are more likely to do so. It also ensures that the economy as whole is stimulated in a way that it might otherwise not have been. Those businesses who accept the cheques will benefit financially, and there is a multiplier effect in their local economies. So perhaps a helpful approach would be to make the share in CapGlobalCarbon tradable with something analogous to cheques vacances, rather than normal currency. Let’s call them clear air cheques. In a Cap and Dividend-type scheme, for example, the trust would auction off emissions permits and collect the revenue in ordinary money. Then it would issue an equivalent amount of clear air cheques to the population on a per-capita basis. (They wouldn’t have to be paper cheques of course – they could simply be credited to “clear air accounts” that people would have on their mobile phones or smart cards). The clear air cheques would have an expiry date, so they wouldn’t be hoarded, and they could be spent just like cash, but only on certain things. These could include legal aid for the securing of commons rights, renewable energy projects, and investment projects that would not use a great deal of fossil fuel – ideally, none at all – but that would nonetheless be important to community wellbeing, such as health care and education, or that would support carbon sequestration activities, such as organic farming and tree planting for agro forestry and water catchment protection. Those receiving the cheques would be able to redeem them with the trust and get regular money back. For the recipients of the allocations, this would be a very similar set-up to the pay-as-you-go accounts that many mobile phone users have, which also often expire after a certain length of time if they are not topped up. In fact, it should be no harder to grasp than one of those accounts is: the allocation would go in in much the same way as a top-up and then you would use the credits. For the retailers, it would be like dealing with any voucher or coupon, or a currency different from the usual one they deal with – it would involve slightly more work than regular cash but would be worth it for the extra business. All the transactions could be handled electronically with no more fuss than existing mobile phone accounts. Some readers may now be thinking that this is all very well, but how would it help with the lack of infrastructure? As we already noted above, there is no use in having a lot of money available for individuals to pay for their childrens’ education if all the schools in an area are overcrowded and badly designed, or nonexistent. Health care facilities are also very thin on the ground in some areas of the world, and renewable energy technology, which would be an ideal thing for individuals or small groups to spend CapGlobalCarbon money on, is still in its infancy in many parts of the world. One approach might be for the trust that administers CapGlobalCarbon to divide up the revenue from the permits and use some of it for top-down infrastructure development. Indeed, it might be a good idea to use part of the revenue to set up a Children’s Fund as suggested by Laurence Matthews . However, the greater the portion of the revenue that was used in this way, the further away we would arguably get from the idea of treating the atmosphere as a commons, as it would take some power away from ordinary people who would no longer have their total share of the revenue. It takes us further away from the principle of subsidiarity which John Jopling describes, that suggests that decisions should be made at the lowest possible level. We could then run into the same old problems with bureaucracy, corruption and inflexibility that arose in the era when top-down developmental decisions were considered the only way forward, not to speak of the ethical issues described above. In any case, much of the development needed is actually on a small or intermediate scale and decentralised, rather than on a large scale and centralised – things like solar power installations, primary health care clinics and schools which function best when they are not too large and unwieldy – in addition to organic farming methods and agro-forestry which would address another aspect of commons erosion. Such investments make most sense when done on a community level, rather than by individuals acting entirely separately or by regional or state governments. Here is where we get to the interesting part. Since mobile phones are so helpful for social networking, they could be used to help make community-wide decisions about how to allocate larger amounts of money. Whenever members of a community heard that allocations of the share were on their way, they could hold a meeting and compile a list of projects that they considered to be a priority for the whole community, such as getting legal aid for establishing commons rights, building a school or a primary clinic, or sending one or two people from a village to a Barefoot College to train as solar engineers. People could then pool their clear air to pay for the projects. They would have choices as to which projects they wished to prioritize and they could “vote” with their mobiles or smart cards to allocate their funds accordingly. In this way the decision-making process would be kept as broad as possible (and out of the hands of local élites who might otherwise co-opt it), but the local currency would be spared the burden of dealing with everything at once: much of the money would be kept out of immediate circulation for dealing with larger, medium-term or long-term community-based projects. Obviously this is just a rough overview and there are many ways in which a system such as this could be fine-tuned. For one thing, it would probably be a good idea to make at least a portion of the allocation convertible into the local currency right away, so that people with immediate needs for essentials such as food could meet them. For another, there are some areas of the world that are not in the cash economy at all, and people in those areas might well prefer to keep them that way. As mentioned above, many cultures and traditions believe that money should be treated with extreme wariness, and for good reason. Individuals or communities should therefore be able to simply opt out of the scheme if they wish, or to donate some or all of the proceeds from their allocations elsewhere . This decision needs to be made by ‘ordinary’ people, though – not by powerful people acting on their behalf, including powerful people from within their own country or culture. Attention especially needs to be paid to gender rights: there is a tendency for women to be sidelined by default, and this needs to be consciously addressed in cash transfer programmes . Again, the logistics of this is something that communication technologies could help with. One other point to make about the share is that it represents an entitlement – a right – rather than justice in and of itself. What I mean by this is that per-capita shares follow the same logic as one-person, one-vote political systems. Just as voting rights grant individuals a certain amount of power but we also need a legal system to handle issues of justice, the share in CapGlobalCarbon ought to represent a step towards greater justice for those who are disempowered at present, but certainly shouldn’t be considered to deliver complete justice. Much more is needed for that, possibly including the legal enforcement of Greenhouse Development Rights. In the meantime, while such legal issues are being thrashed out, we could at least get on with distributing the share. We shouldn’t lose sight of the fact that it could save many lives in the short term. There’s still a problem, though. It might be possible to distribute the share effectively, and it might prove very useful in the effort to reestablish commons-based land use and to eradicate poverty, as well as for encouraging investment in a renewable-energy-based economy, but there is a powerful elite in the world – the top 30% – which may not be terribly happy to see those things happening, particularly if they believe that it would impact on their own wellbeing. This brings us onto the topic of power dynamics and the ways in which the less-powerful relate to the more-powerful in the world. That’s clearly an enormous subject. I’ll limit the discussion here to possible triggers for decreases in income inequality, since that is something that relates directly to CapGlobalCarbon. What sorts of things make the rich willing to fork over some of their money to the poor? It’s easy to get the impression from the media that the gap between rich and poor is widening all over the world right now; that’s certainly the case in some important countries such as China and India. However, there are also exceptions to this trend, and if we look at real-life places with (modestly) decreasing inequality we can see that a certain political momentum can build which makes it quite difficult to undo various changes once they have taken root. The clearest example of this is probably Latin America . I’ll focus in particular on Brazil and Mexico, both of which have notoriously powerful and unscrupulous elites, but which also have extensive social transfer programmes. Mexico remains a highly unequal society, but over the past two decades its level of inequality has decreased slightly. A UNDP study on the reasons for this concluded that it is caused by a better-educated workforce and by its massive social transfer programme. In fact, there’s a connection between these two things because the social transfers encourage people to enroll their children in school. A quarter of Mexico’s population, or 6.1 million households, is covered by its Prospera programme, which started in 1998 and has been greatly expanded over the years. Under the programme (which has undergone several name changes over the years), families receive cash transfers in exchange for enrolling children in education programmes and ensuring they have regular health care check-ups. What’s particularly relevant to our argument is that the programme has proved to be politically robust. According to the UNDP study, “The programme is […] notable in having survived not only a change of administration (no other major anti-poverty initiative over the past two decades has done this), but also in having survived the first change in 70 years of the political party in power. In fact, rather than discard the programme, the new party’s administration changed its name from Progresa to Oportunidades, and starting in 2001 the new government increased coverage from 2.3 to 4.2 million households (mainly in rural areas), and added semi-urban and urban localities to the already established rural ones.”  During the election of 2006, the two biggest parties both put considerable effort into claiming credit for the programme. We mustn’t be too starry-eyed about this; an article in Policy Studies from 2009 claims that “both Progresa and Oportunidades were specifically aimed at appeasing and depoliticising the increasing presence of resurgent popular movements, whilst acting as a bromide for the masses, so as to signal political stability and a disciplined labor force”. There seems little doubt that Oportunidades played a major role in enabling the re-election of the right- wing PAN party in 2006, which is hardly a champion of the poor. At the time when Oportunidades was extended, corresponding cuts were made to general social welfare programmes. On the other hand, the current centre-left government (as of 2012) is, in turn, extending the current Prospera programme to include more recipients, and it introduced new benefits in 2014 . We mustn’t ignore the fact that this programme has genuinely improved life for a great many people, not only by increasing their immediate income but also by improving their health – including life-and-death health issues such as infant mortality rates – and their nutrition and education. And if the author of the Policy Studies article is correct, then Prospera was implemented in direct response to popular movements. This doesn’t mean, of course, that recipients aren’t entitled to any more than they receive at present, or that they should allow themselves to become ‘depoliticized’. What it does show is that there’s a dialectic at work: the élite were responding to pressure from below. So what would happen if there was a push from below for a specific, easily-implemented, efficient scheme such as CapGlobalCarbon in a place like Mexico? Now let’s take a look at Brazil. As in Mexico, Brazil’s major social transfer programme is popular and politically robust, and to a greater extent than Prospera, it has achieved real results in reducing inequality. A 2011 New York Times commentary on Bolsa Familia, the Brazilian equivalent of Prospera, states that “today […..] Brazil’s level of economic inequality is dropping at a faster rate than that of almost any other country.”  A 2016 Foreign Affairs article states that “according to Tereza Campello, the country’s minister of social development, the income of the poorest 20 percent of Brazilians rose by 6.2 percent between 2 002 and 2013, while that of the country’s richest 20 percent grew by only 2.6 percent.” This is in a country that used to be among the most unequal in the world. Despite a recent downturn in the Brazilian economy, “Brazilians continue to support Bolsa Família”, according to a 2014 Pew Foundation survey. 75% of the populaltion supports the programme. This doesn’t mean that it’s universally popular of course – a glance through the comments section of any online article about it will quickly demonstrate that it isn’t, and as the Pew Foundation study explains, only 48% of those with a higher-level education and presumably, a relatively high income, are in support of the scheme – but it’s worth exploring what might be making it attractive to at least some of the rich in Brazil. In this case it seems unlikely that they view it solely as a political tool for getting their favoured parties elected. Perhaps there are other factors involved. What could they be? Here we come to the third phenomenon which could act as a boost to CapGlobalCarbon: an increasing recognition of the importance of tackling entrenched and extreme inequality. Although many of us have always had a hunch that people were better off in more equal societies, it’s been difficult up until recently to muster a coherent practical argument against the fear-based stance of those who believe otherwise. What could you say to argue against people who believe that human nature divides us inexorably into predators or prey, so that the only meaningful thing you can do in life is to look after your own, by the most ruthless means if necessary? The Golden Rule and other moral arguments in favour of fairness sound woolly and flaky to them. I referred above to a major World Bank study which tracks the relationship between inequality and violent crime and shows that there is a strong correlation between those two phenomena. What’s particularly interesting, though, is that everyone in society is affected, not only those who are less- privileged. In a more equal society, the rich are also less likely to suffer the effects of violent crime. Over the past few decades there has been voluminous research into the causes and effects of inequality, and it is a major focus of the UN’s post-2015 development agenda. A useful overview of the inequality research is provided by the book The Spirit Level, by Richard Wilkinson and Kate Pickett. It picks up on the study mentioned above and on a great many others, demonstrating that the rich would benefit in almost every way imaginable from a more equal society. They would be healthier, longer-lived, better educated and less likely to become addicts. More equal societies also tend to be more innovative and their members are more willing to trust each other, qualities which could prove very helpful during the coming adjustment to a zero-fossil-fuel economy. This correlation between greater equality and wellbeing holds in places with widely differing cultures and levels of overall wealth. In fact, the sole way in which the rich might not benefit from greater equality is that they might possibly have less money than they do now. And of course money is only valuable if you can spend it on things that you value. If people are willing to spend $230,000 on a guard dog to protect their property, it’s possible that they might begin to see the sense of sharing out some of their money in order to help prevent their fellow citizens from turning to violent crime. Of course, it’s also possible that some of them are just too out of touch with reality to be reasoned with at all. It would be naïve beyond absurdity to assume that everyone in the top 30% will accept these ideas without demur, saying “ah yes, I see we were wrong all along to try and preserve our wealth at the expense of everyone else – here, take some of my money!” The book Treasure Islands by Nicholas Shaxson  gives plenty of examples of people who are unlikely to be swayed by any appeal to share their wealth, even when the sharing-out would clearly work to their own benefit; their mental state is simply too pathological for them to be reachable. The fact remains, though, that not everyone in the top 30% always behaves that way, as we can see from the attitude of roughly half of rich Brazilians. Of course we don’t know for sure whether the support they express towards Bolsa Familia derives from a feeling that life is better in a more equal society; it could also derive from a (hitherto unguessed-at) sense of basic fairness, or else perhaps from some deeply cynical line of reasoning that I can’t fathom. But in any case, the examples of Brazil and Mexico show that the political dynamics leading to social change are complex and not always what one might assume; the rich do not simply crush the poor, always and everywhere. While we certainly shouldn’t blithely assume that everything will work out for the best, we should note that pressure from below can sometimes trigger real change, as seems to be happening in Mexico. And other factors may be at work too: it’s possible that at least some rich people recognize on some level that they themselves would benefit in various ways from greater equality. So it’s quite handy to have the hard facts regarding equality and wellbeing at our disposal while promoting a scheme that would increase equality. Sometimes facts do work against fear. One final point that should be emphasised – it has already been mentioned above – is that we should not expect cash transfers to be able to ‘heal’ inequality, and for that matter, end poverty, all by themselves. Other measures are clearly needed too, including more structural-level changes. Much useful research has been done on this in recent years by Thomas Piketty and other analysts. None of their suggestions, however, take away from the argument that cash transfers can play a useful role in bringing about a more equal society. So to summarize: We’ve taken a look at two questions to do with global CapGlobalCarbon, namely, whether it would be possible to distribute the share globally on a per-capita basis, and whether it would be wise. We’ve noted how development theory is now broadly in agreement with the commons-based philosophy behind CapGlobalCarbon, which maintains that the decision-making process about resource allocation should be kept as broad as possible. We’ve seen how recent technologies such as smart cards and mobile phones could help to make the share distribution feasible, even in areas that are off-the- grid, or have high levels of illiteracy or crime. We’ve explored a possible way to use the new technologies in order to ensure that an adequate amount of investment is put into infrastructure development, while at the same time keeping inflation and other sources of economic instability at bay. And finally, we’ve taken a look at the political dynamics that underlie the implementation of existing large-scale allocation schemes, in light of the vast amount of research that has been done into the relationship between equality and wellbeing. Note: this is an updated version of a chapter that formed part of the Feasta Climate Group’s 2012 publication Sharing for Survival. Apart from bringing the research up to date, the main difference with the original article is that this version assumes that the revenue that funds the shares will be generated by an auction for fossil fuel production permits. For an explanation of the difference between this and the original, ‘classic’ Cap and Share system, please go here. Special thanks to Fauzia Knight for drawing my attention to social transfers and their possible relationship with Cap and Share, back in 2007. 1. Some notable thinkers, such as Gandhi, challenged this approach to development from early on. 2. Hanlon, Joseph et al (2010), Just Give Money to the Poor: The Development Revolution from the South, Kumarian Press, page 4. 7. See for example “Catching People Before they Fall: Social Safety Nets Take Center Stage”, World Bank website, http://web.worldbank.org/WBSITE/EXTERNAL/NEWS/0,,contentMDK:22632052~pagePK:64257043~piPK:437376~theSitePK:4607,00.html . The World Bank favours conditional transfers, which is a matter of some controversy. 10. If a labelling scheme for fossil fuel were to be introduced as a stepping stone to CapGlobalCarbon, it could help to ease the transition to larger cash allocations as the initial allocations, deriving from permits sales to a small humber of companies, would probably be fairly modest in size. More information on labelling can be found at http://www.capglobalcarbon.org/2016/05/14/paving-the-way-for-capglobalcarbon-a-labelling-programme/ . Further down in this article, another possibility is described: allocating some of the transfer money to renewable energy projects and other community projects. 11. Such long-term transfers would probably be more modest in size however, and so once again, accurate information would be important to beneficiaries. 19. For a fascinating glimpse into the ways in which mobiles are being used worldwide, see the textually.org website. 24. Fajnzylber, Pablo et al (2002), “Inequality and Violent Crime”, Journal of Law and Economics, vol. XLV (April 2002) http://siteresources.worldbank.org/DEC/Resources/Crime&Inequality.pdf. This study tracked the relationship between income inequality and violent crime in 36 countries over the course of several decades. 25. See for example David Korowicz’s article ‘On the Cusp of Collapse’ in Fleeing Vesuvius: overcoming the risks of environmental and economic collapse, 2010 Feasta. 27. It has been suggested that a new world currency, the emissions-backed-currency-unit or ebcu, be introduced along with CapGlobalCarbon. See http://www.feasta.org/documents/energy/Cap-and- Share-May08.pdf. Ebcus would be allocated to each country according to their population, with the stipulation that a part of the allocation would have to be used to pay off international debts. This would be easy for highly-indebted countries to do as their currencies would be strong in relation to ebcus. However, it may not be wise to introduce a currency that is backed by something – carbon dioxide emissions – which we eventually want to eliminate altogether. 30. The beer-and-fast-motorcycles argument is very interesting because it touches on an important aspect of the world economy: the fact that it triggers stress which can then lead to unhealthy addictions. ‘Shopaholism’ and over-consumption in general have been linked convincingly by researchers to other, ‘harder’ forms of addictions with common roots in brain chemistry that has been distorted by a stressful environment. If the economy were less chaotic and more equitable, the stresses that drive people to spend money unwisely would probably diminish. See http://www.feasta. org/2011/07/16/is-over-consumption-hard-wired-into-our-genes/. 35. Such community meetings could make use of already-existing political structures if these seemed appropriate , such as the Indian panchayat raj that James Bruges describes (http://www.sharingforsurvival.org/index.php/chapter-6-cap-and-share-in-india-by-james-bruges/ ). The main difference between my proposal and his is that I believe funding decisions, including those which require pooling of money, should primarily be made by individuals acting within small community groups rather than by elected community officials acting on their behalf. 36. These emergency funds could eventually be replaced by a permanent basic income scheme as described further back. 37. There is nothing fantastical about the idea of ‘underdeveloped’ peoples donating to help others, including supposedly more developed communities, in times of crisis. At the time of the Irish famine in the nineteenth century the impoverished Native American Choctaw tribe, who had themselves experienced a famine a couple of decades earlier, made a donation to Ireland. Probably the most recent example is the donation of $50000 from the city of Kandahar in Afghanistan to the Japanese relief effort in the aftermath of the 2011 earthquake in Japan. 42. Soederberg, Susanne (2010) ‘The Mexican competition state and the paradoxes of managed neoliberal development’, Policy Studies, 31: 1, 77 — 94. 49. A notable exception to this rule is Mexico. Violent crime there has risen sharply in recent years, despite the success of the Oportunidades social transfer programme. This increased crime rate appears to derive from extensive drug trafficking between Mexico and its much wealthier neighbour, the USA, with whom it shares a long border. The violence is concentrated in areas of the country that are strongly affected by the drug trade. In previous articles on this website we’ve described a couple of existing models that we think could provide useful lessons for CGC. We’ve looked at an international movement, organised by a group of NGOs, which has made significant progress in eliminating something that is noxious – landmines – from the world. Also, since we know that the atmosphere is our collective responsibility, we’ve explored the voluminous research on existing commons – collectively-managed common pool resources – around the world which present useful guidelines, based on a vast quantity of practical experience, concerning the framework that CGC would need to use. In this article we’ll have a different focus: we’ll look at how CGC could be established in the first place. (There’s some discussion of how CGC could be implemented on this website already, but there’s plenty of room for more. This article is intended as a contribution to that.) So we’ll examine a different kind of model that could act as a kind of stepping-stone towards implementing CGC fully. Implementation is a question that tends to come up again and again with regard to CapGlobalCarbon. Given the close link between GDP and fossil fuel consumption and the political weight of fossil fuel lobbyists – plus, not uncoincidentally, a marked reluctance on the part of governments to take legally binding action to end fossil fuel use – how could a project like CGC possibly gain any traction? One strategy for the short term, which might seem counter-intuitive at first, would be to bypass state governments and approach the fossil fuel companies themselves to see if any of them would be willing to sign up to a labelling programme that would pave the way for CGC. To be eligible for this programme, they would have to undertake to completely transform their activity over the next few decades, achieving a one hundred percent transition to renewable energy by 2050 at the latest. In addition to the radical structural changes that would require, they would also commit to paying the Trust (or whoever is running the programme) annually for a limited number of fossil fuel extraction permits (and this money would be a precursor for the share in CapGlobalCarbon). Finally, they would also allow external monitors to verify that their production did not surpass the limits dictated by the number of extraction permits they bought from the Trust each year. These companies would most likely pass on higher prices to consumers as a result of having to buy the permits, but they would be able to claim the ethical high ground as compared to fossil fuel producers who didn’t sign up. Moreover, the higher prices would be partially offset by the distribution of the share. Not only that: the increased prosperity that many people around the world would experience as a result of getting their part of the share would also help to offset any decrease in GDP brought about by the reduced fossil fuel consumption. The more companies on board, the higher the share would be, and this would also lead to increased pressure on nonconforming companies to join in. The companies could label their fossil fuel so that consumers know that it’s backed up with permits. One could argue that there are precedents for this such as certified organic food, sustainable fisheries and sustainable forestry. However, we need to tread carefully because there’s an important difference between labelling fossil fuels and these ecolabelling schemes: they promote things that are desirable. It would be greenwashing to imply that fossil fuel consumption is in any way sustainable or responsible. So the the choice of label is important. Something like ‘transition fuel’ or ‘phase-out fuel’ seems clear and fair. Before approaching the companies, it would be necessary to have the programme’s structure up and running, either by establishing the Global Climate Commons Trust or by arranging for some other institution to handle the administrative tasks. There would need to be sufficient funding and support from other organisations for the programme administrator to be able to handle three things: the sale of the permits to the companies, the monitoring and the distribution of the share. And this funding would have to come from somewhere other than the fossil fuel companies. You might well wonder why fossil fuel companies would have any interest in signing up to this labelling programme. Why would they voluntarily make such drastic changes to the way they operate – and also hand over what would probably be a substantial amount of money to the Trust, every year? There are a few reasons why it might just happen. One is that within the fossil fuel companies themselves there are probably quite a few individuals who are getting increasingly worried about climate change and want to do something about it. CGC would provide a clear roadmap – clear both to themselves and to observers from outside – to enable that to happen. Another, already mentioned above, is that the companies could get brownie points for (relatively) good behaviour. Finally, the labelling approach could be presented as an offer that’s very hard to refuse. This is because of a fourth precedent for CGC which we’ll discuss in more detail our next post in this series: climate litigation. Quite simply, if fossil fuel companies declined to comply with the labelling programme, they could be threatened with legal action. Of course, they could opt to brazen things out and see what happens when they are brought to court . But they might prefer to save face – and possibly also save a great deal of money – and sign up for labelling instead. I had the uneasy privilege of being able to attend a few days of the COP-21 Paris summit and I was moved by the sheer volume and variety of people gathered there from all over the world to try and address the climate crisis in a spirit of cooperation and (officially at least) on an equal footing. It gives you a vision of how the world could be, even if you know very well that it’s a mirage, that the real power lies elsewhere, that many of the people negotiating in Paris are effectively just ground troops who are following orders. Personally I’m much happier to see the negotiators all clapping, cheering and shaking hands than yelling at each other and storming out of rooms. But I’m worried that all the clapping, cheering and hand-shaking will turn out to be just like the Christmas Truce of 1914. German, English and French ground troops back then temporarily stopped fighting and instead exchanged greetings and gifts, and sang Christmas carols together. There was a certain amount of musing about the absurdity of the war. But the officers quickly threatened disciplinary measures and within a few days, things were back to normal – the soldiers were obediently firing at each other again and the grotesquely meaningless war continued as though nothing had happened to interrupt it. I can’t shake off a deep fear about the climate, nor a nagging concern that the agreement as it stands is not nearly strong enough on justice and equity. It’s good that the agreement requires countries to ‘pursue efforts to limit the temperature increase to 1.5 °C above pre-industrial levels’. It’s better than nothing that it implies that emissions will need to be net zero ‘in the second half of this century’ – although the science indicates that in order to (possibly) avoid even a 2 degree rise, what is actually needed is net zero emissions by 2050 at the very latest. It’s slightly better than nothing that the agreement says that equity and justice need to be taken into account. We all knew in advance that there wouldn’t be anything legally binding on climate finance, because of the politics involved, particularly in the US. However, abundant and reliable climate finance is what is needed and a way needs to be found to achieve that. I hope that those who argue that the agreement will send a signal to markets that the age of fossil fuels is over are right. But I’m not convinced. At one of the summits’ many ‘side events’ – enormously informative and constructive sessions that were mainly organised by NGOs – Julie-Ann Richards of the Climate Justice Programme pointed out that the phrase ‘fossil fuels’ doesn’t appear even once in the agreement text. How can we seriously expect to lower emissions when we not only do nothing to control a major source of those emissions – worse, we even subsidize it heavily? Then there’s military funding – a huge elephant in the room that was pointed out by a member of the audience at our own side event. About $1629 billion dollars are spent every year worldwide on defense. Again, it’s easy to tell what is truly being taken seriously by governments and what is not. If climate was taken seriously, much of this funding would be diverted from the military in recognition of the fact that we’re facing an emergency and need to act as though we are on a war footing. It’s a question of survival, so it should be obvious that it’s also a question of defense. Instead, the summit seemed at times like a huge promotional event for travel agents. The richer countries had the most amazingly elaborate stands and displays. India’s was particularly striking as it featured a waterfall within which there was a kind of water-based powerpoint presentation. Indonesia’s had nice parasols, Peru had a lovely display sign, the US had all kinds of fancy screens. Meanwhile the delegates from the more desperate countries, like the Marshall Islands, tended to stick to plywood for their stands and in any case, weren’t usually around to mind them. During the time that I was there there seemed to be no real sense of emergency on the part of many of the delegates. I looked in on a plenary presentation and it seemed to be sheer show business, smooth and slick, complete with booming music from loudspeakers every time someone new took the floor. The free travel passes for Paris that we were all given made it very tempting to take a bit of time off and go visit the Louvre. I’d love to believe that the pleasure of spending time in such a rich cultural setting helped the negotiations along. Maybe it did. Maybe. I realise that many of the summit attendees do care about the climate and that, despite the distractions, a lot of hard work was done. But in any case, I don’t think the negotiators could be expected to really deliver what we need. To reiterate – the negotiators are ground troops. The framework within which these talks take place, pitting countries against each other, is wildly inappropriate, just as the dynamic of the First World War made it impossible for the soldiers to continue their truce. What’s needed is a back up to the international negotiations to ensure that emissions really get reduced and justice is truly respected. This is what we’re proposing with CapGlobalCarbon. Will the Paris agreement prove to be as ephemeral as the Christmas truce or will it mark the beginning of real movement on climate change? A lot depends on popular pressure and on cool-headed, realistic thinking. Visions are great – indeed, necessary – for inspiration. Now it’s time to work on the reality.